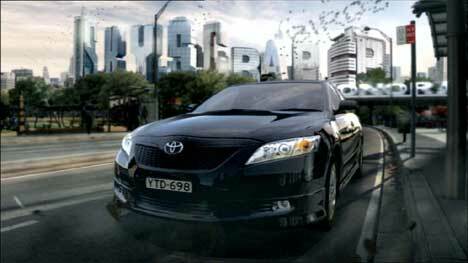 Toyota is promoting the Camry in Australia with a series of television advertisements featuring a three dimensional CGI world in which objects take on the shape of words. The fifteen second pre-launch, Toyota Planet, begins with a shower of meteors approaching planet Earth. As we zoom in on Australia, we see a solar panel, clouds, a city, a golf course, bush and a lake. A 747 jet flies over the city, we keep zooming in, now viewing a park, a monorail. At street level, we see a sleek black Toyota Camry, backed by skyscrapers. 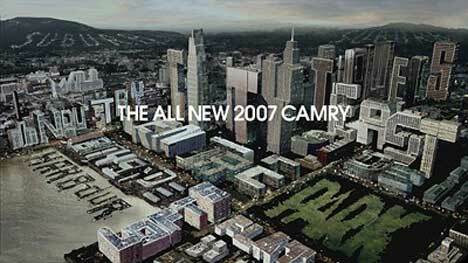 The voiceover: “Toyota is looking at the world in a completely new way”. The Toyota Camry Grande New World campaign was developed at Publicis Mojo, Sydney, by regional executive creative director Darren Spiller, copywriters Steve Jackson, Alex Derwin and Mike Burdick, head of art Simon Cox, art director Russell Heubach, strategist and automotive specialist Amanda Wheeler, and agency producer Nigel Kenneally. The prelaunch 15 second TV commercial was put together by animation director Scotty Wilcox at Fanatic Films, Sydney, with producer Jayne da Costa, concept designer David Webster, technical directors Nigel Haslam and Chris Gardner, animators Chris Gardner and Nigel Haslam, environment modellers Celine Velasco and Justin Robson, with matte painting by the appropriately named Steve Matson. The 30 second campaign post production was developed at Brand New School, New York, by director/concept artist Jonathan Notaro and Jens Gehlhaar, animation director Dickson Chow, print producer Greg Tearne, photographer Ian Butterworth, art buyer Alison Dunlop, producer Amanda Slamin, Flame artist Blake The Colt Huber, compositors Irene Park, Bee Jin Tan, Jin Lee, Jose Fuentes, Amber Kusmenko, Rotoscopers Tonya Smay, Brendan Smith, Connie Conrad, Shana Silberberg, Anca Risa , designers Keetra Dixon, Danny Ruiz, Eric Adolfsen, Ludovic “The Wolf” Schorno , 3D artists Ylli Orana, Jordan Blit, Mike “Tequila” Papagni, Helen Choi, Kyle Cassidy, Kitty Lin, Kim Kehoe, Matt Connolly, Tony Barbeiri, Sung Kim, Doug Vitarelli, Ho Sik Nam, concept artist Ronald Kuraiawan, and account team Susan Coghill and Amanda Wheeler. The city shots were filmed in Wellington, New Zealand. The country shots were filmed in the Wairarapa region, New Zealand. Local production services were provided by Cherokee Films, Auckland, by director of photography Chris White, production designer Danny Black, first assistant director Toby Pease, precision driver Mark Prowse, producer Katie Smith and production manager Carey Johnson. Sound was designed by Simon Kane at SongZu. Editorial work was done at BlueRock, New York, by Geordie Anderson. Music for the 60 second spots is “Age of Consent” by New Order.